The world knows Nostradamus as the man that predicted many major world events. Well 5thRounders, Ngo-stradamus will look to do the same thing, but in the context of the MMA world. The all-mighty one was on fire at UFC 97, bouncing back with a convincing 4-1 mark. That makes him 55-25 over the last 16 UFC events. Check out how he foresees UFC 98 playing out. Edgar was quickly moving up the ranks before his minor setback against Gray Maynard one year ago. Although that remains his only professional blemish, Maynard exposed Edgar’s lack of size in a division where the champ is capable of contending at 170 pounds. The soon-to-be 36-year-old Sherk is desperately trying to make one final run at UFC gold. Although Sherk is creeping up there in age, he still has won 16 of his last 18 fights, with his only losses coming at the hands of UFC kings Georges St-Pierre and BJ Penn. Sherk should easily dominate the smaller Edgar, especially if this turns into a wrestling match, however the all-mighty one would never take Sherk at -450. Miller has made quite the impression since entering the UFC three victories ago. Although he was dominant in all of those performances, he has yet to test his skills against the division’s best. Sonnen was once the WEC’s top middleweight contender, however was far from impressive in his Octagon debut. Granted it was middleweight sensation Demian Maia that schooled Sonnen at UFC 95, he will still need a W this Saturday to secure his future with the world’s biggest MMA organization. Although he was able to take Denis Kang the distance in his UFC debut, another loss this weekend could have Foupa-Pokam right back in the unemployment line. The Frenchman is dangerous on his feet, so McFedries needs to be on high alert. Speaking of unemployment lines, McFedries needs to produce a win in the worst way. The UFC vet has dropped four of his last six, including two straight. If he wants to keep his head off the chopping block, he will need to be the aggressive gunslinger that the UFC was drawn to in the first place. After years of injuries and postponements, the time has finally come. Although their grudge would be much more compelling if either of the former champs were in possession of a title, there still is a legit beef between the two that has extended to their wives. Hughes hasn’t seen action since getting demolished by top contender Thiago Alves at UFC 85. Before that, he convincingly lost a rubber match to the aforementioned St-Pierre at UFC 79, a bout initially intended for the injured Serra. Serra hasn’t seen the inside of an Octagon since he lost his belt to GSP at UFC 83 over a year ago. Since then, he suffered a back injury that required surgery and extensive rehab. Even though this bout has lost a lot of its luster, the two have done a great job of selling the feud as they have continued to blast each other in the media as game-time approaches. The curse of the UFC light heavyweight champ? 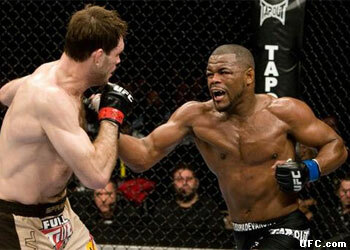 Did Forrest Griffin start a revolving door trend? Is the 205-pound division that talented where they can rotate the title between a handful of contenders? It is highly possible the UFC’s most coveted crown will once again change hands before it is successfully defended. The division is indeed THAT deep and THAT talented. At 14-0, Machida should have had his crack at the strap a long time ago. However nobody likes to watch a cornerback backpedaling for 15 minutes, so the UFC forced him to produce more than just W’s, they told him to be exciting. Needless to day, he delivered. Machida’s 1stRound knockout of Thiago Silva at UFC 94 was nothing short of spectacular and that is why he finds himself in the spot he’s in. It would be tough to argue that there is anybody out there, in any division, that has improved on their overall MMA game as much as Evans has over the past few years. The training and commitment the former collegiate wrestling standout has displayed at Jackson Submission Fighting camp in New Mexico has allowed him to take his talents to a whole new level. The all-mighty one foresees Machida being anointed the division’s new king come Saturday, however being more than a 2-to-1 favorite is a little much.